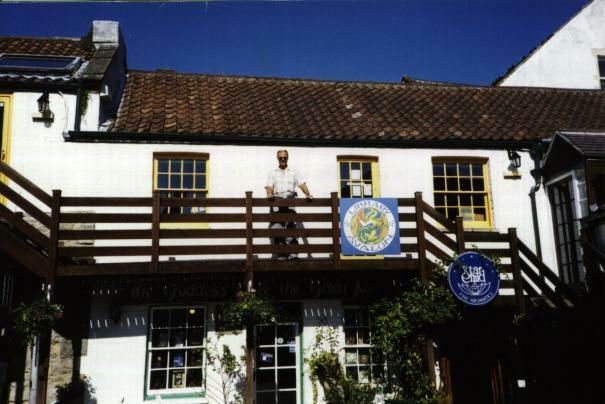 The site of Tony Duhig's Jade Warrior Studios in Glastonbury, Somerset, England. The studio was located on the second floor of a building on High Street in downtown Glastonbury, overlooking a pleasant open courtyard which now serves several shops and a good used-book store. The area occupied by the studios (directly behind your intrepid reporter) is now a library. 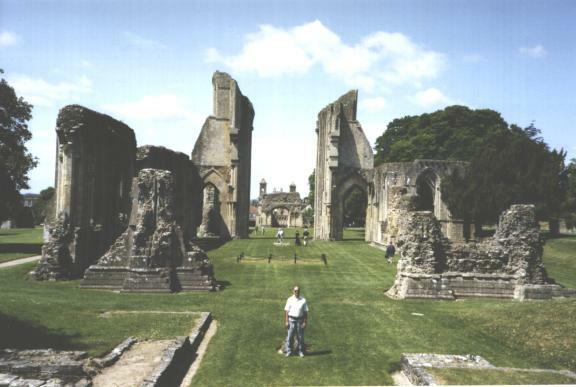 The courtyard is a short distance from the site of Glastonbury Abbey, and a mile or so from Glastonbury Tor (believed by many to be the site of the original Isle of Avalon as told in the legends of King Arthur). It's also right across the road from Café Galatea, which serves excellent vegetarian fare at very reasonable prices - it was some of the best food I'd had in England! Photographs courtesy of Gwen Gunderson.